Emulex won in this category. Adrian Aubrey accepted the award. Mimecast won in Messaging Product category. Nick Lennon and Kirsty Toozs-Hobson accepted the award. Extreme Networks won in the Data Centre Product category. Steve Johnson collected the award. 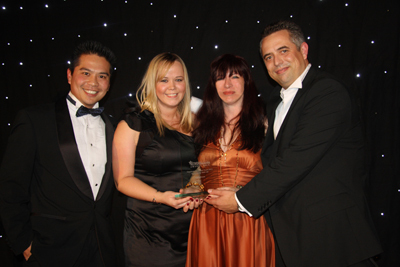 Altitude Software were crowned winners in the Contact Centre Product category. Adrian Wright accepted the award. Quantum were winners in the Storage Product category. Thomas Feil and Pam Napier accepted the award. Excel was voted Cabling Supplier of the Year. John Twidell and Ian Irving accepted the award. Overland Storage won in the Hardware Product category. Tim Beck, Kevin Gosden and Kieron Moore stepped up to the stage to accept the award. Vigil Software was voted Distributor of the Year. Michael Tye, Alex Teh, Jenny Jones and Sian Easton accepted the award. Brookcourt Solutions became Reseller of the Year. Phil Higgins and Kate Wallyn stepped up to accept the award. In a category open to all solutions reviewed by Network Computing over the previous 12 months, the judge selected KEMP Technologies' Loadmaster 5500 as the winning product. Leigh Bradford of KEMP accepted the trophy. A number of parties collaborated in a project to help the Ambulance Service. Frank Puranik and Graham Wood of iTrinegy accepted the award. Ruckus Wireless triumphed in the Network Project of the Year - Private Sector. John McGann and Eddie Felman of Ruckus Wireless accepted the trophy. Nexenta Systems was voted the Most Improved Company of the Year. Mike Green accepted the award. For the first time, the Network Computing Awards recognised personal achievement through the Wick Hill Award for Contribution to ICT. Randall Overby of BNY Mellon was voted the winner and stepped up to the stage to receive this award.